A Healthier Option provides a health matrix for your options table. It measures a lot of technical stats about your table, makes recommendations, and gives you a simple way to implement those recommendations. A side note: As always, you should totally make a backup of your database before doing anything. Ever. The health matrix allows you to diagnose issues and the table below it helps you treat those issues. 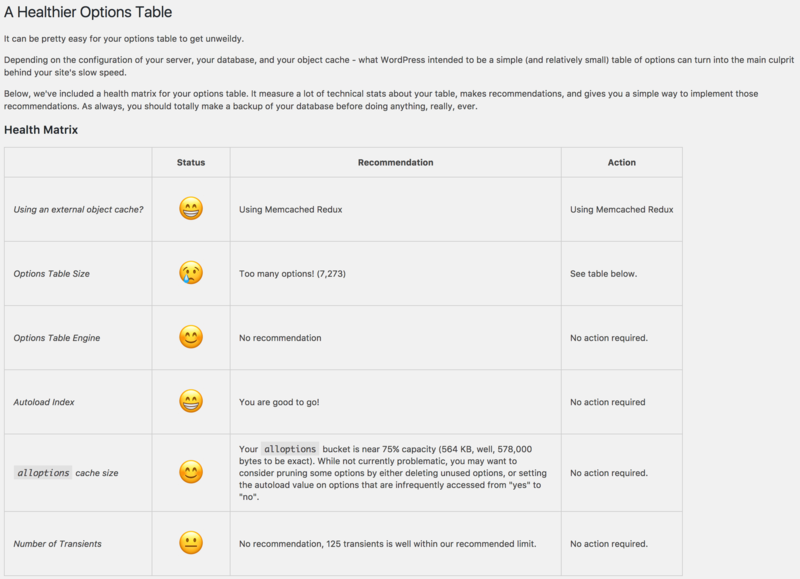 In classic Zao fashion, we wanted to make it fun, so each component that is measured is evaluated with an emoji first, followed by a recommendation, and, if necessary, the action required. Sometimes there’s a recommendation without a required action, since it’s not necessarily required immediately. The health of each item is graded on a scale. The options table engine. There are two MySQL engines, but we recommend the more performant one for best results. The evaluation of your server environment takes a couple of things into account. The two main MySQL engines we check for–MyISAM and InnoDb–work very differently. If you have the autoload index running on InnoDb, a much more performant engine, it runs super smoothly. If you have the worse engine, but a good index, that’s bad for your site. A Healthier Option accounts for a different variety of scenarios to optimize your site, enable the right engine, and add the index. The alloptions cache size tends to be one of the biggest culprits for performance problems. A Healthier Option measures the size of your alloptions cache–how many options are loaded in the alloptions cache bucket and what, if anything, needs to be done about it. A Healthier Option also checks for the number of transients. If there are a ton, we recommend that someone downloads a transient manager plugin and delete them. It also gives you the ability to review all of the options in the options table. From there, you can bulk delete, etc. You can also sort by size of the option and autoload, which makes it super easy to get the alloptions cache size down. You can quickly search from largest to smallest and set the autoload to “no” on the largest options. A Healthier Option also protects all of the WordPress core options. The value of all of your active plugins is an option that WordPress stores, and if someone were to use A Healthier Option to accidentally delete core options, it would be terrible. This plugin checks for WordPress core option, but does not allow for WP core options to be deleted, so sites are protected from that potential disaster. This plugin was originally developed for Qpractice, with Lisa League’s brilliant suggestions and feedback. The Qpractice site was having some problems that were hard to debug. Lisa would save an option or a setting for Visual Composer, and then it would disappear, then reappear, then disappear, then reappear…you get the idea. There were inexplicable issues that were, turns out, caused by the alloptions cache bucket being way too big. Things that were expected to be present were not, and it was causing consistent issues. With the help of this awesome article from 10up and addressing Lisa’s issues, we created this plugin and the health matrix to help better identify and document these kinds of problems. We’re stoked to provide another awesome plugin to the WordPress community. Let us know if you have any questions. Try it out and tell us what you think! Super dope. Thanks for this! Awesome tool. Thanks for building this.